Devotion to Our Lady of Sorrows (Mater Dolorosa) is an ancient tradition of the Church. Our Blessed Mother suffered intensely during the passion and death of her Son on the Cross. Seven of her sorrows have been chosen for special veneration. The seven sorrows of Mary are the seven swords which pierced her maternal Heart. By meditating on her Seven Sorrows, we meditate on the sufferings of Mary in union with her beloved Son, Jesus. 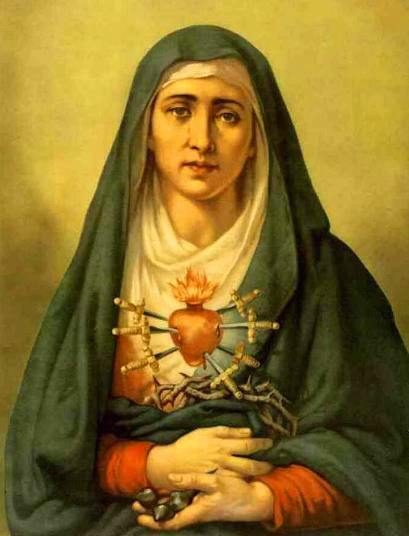 The Memorial of Our Lady of Sorrows is celebrated on September 15th. The Servites (Order of Servants of Mary) began reciting the Rosary of the Seven Sorrows in the 13th Century. After the Church-approved Marian apparition in Kibeho, Rwanda, the Rosary of the Seven Sorrows gained new popularity. It is also known as the Seven Swords Rosary. We can console our dear Mother by praying this rosary and uniting ourselves to her immaculate heart and thus sharing in the sufferings of Christ. Our Lady has promised many graces for those who devoutly recite this rosary and meditate on her sorrows. When Mary and Joseph presented the infant Jesus in the temple forty days after his birth, Simeon received the Divine Child in his arms and praised God. He predicted that a “sword” (of sorrow) would pierce Mary’s soul. When King Herod ordered the death of all male children age two or younger, Mary and Joseph fled to Egypt with the infant Jesus. The journey was a dangerous one and comforts were none. Instead of asking her son for a miracle, she knew it was the will of God and they lived in Egypt for seven years – strangers in a foreign land. When Jesus was twelve years old, he went with his parents to Jerusalem for the Feast of Passover. After losing the child Jesus on the return journey, Mary and Joseph searched for Him with agonizing sorrow for three days, finding Him at last in the temple. As Jesus made His way to Calvary, condemned to crucifixion, he met His dear mother. He was bruised, derided, cursed and defiled and her sorrow was absolute as Jesus dragged His own cross up the hill of His crucifixion. Mary stood at the foot of the Cross near her dying Son unable to minister to him as He cried out “I thirst.” She heard Him promise heaven to a thief and forgive His enemies. Mary watched her Son die a shameful death after three hours of pain on the Cross. She was devastated with grief and pain. Truly her heart has been pierced with a sword. stricken with ardent love and compassion. Mary wrapped the body of Jesus in the Holy Shroud which covered His Bloody wounds. The body of Jesus was laid in the tomb. As she bid farewell to her Son, her heart suffered so much anguish and grief. Recite Three Haily Marys in remembrance of the tears shed by Our Blessed Mother. These are said to obtain true sorrow for our sins. V. Pray for us, O most sorrowful Virgin. Virgin Most Sorrowful, Pray for Us – Say 3 times. Detailed Meditation on the Seven Sorrows can be found here. I encourage you to read it.